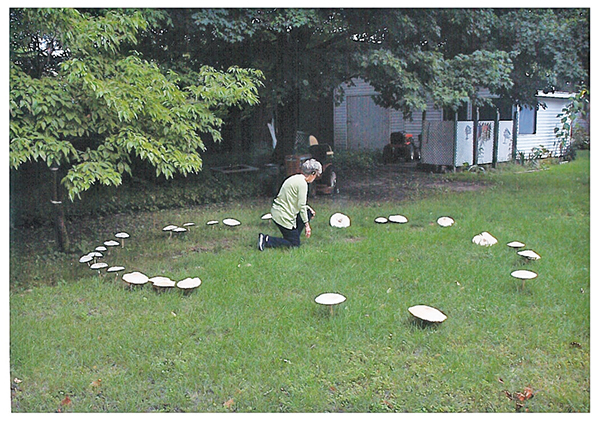 These large mushrooms were found growing in a fairy ring in Cam Teusink’s yard at Beech and Second Street last month. Ranger Steve thought they might be Lepista irina, but there are others that grow in fairy rings as well. Photo submitted by Ed Bremmer. Many interesting mushrooms popped up in the yard, woods and fields during the wet hot weather this fall. Colorful Amanitas with yellow spots on the red cap are beauties to behold but dangerous to eat. Many fungi are edible like puffballs but one needs to pay attention to details and be careful. My friend Donna Hickey had four sisters and a brother. Donna died in her 90’s in the 1990’s. When they were young girls, their mother sent them out to pick mushrooms with instructions not to eat any until she looked at each one. Her 5-year old sister ate one before her mother looked at them. She got sick and they sent for the doctor. It took him awhile to get there with horse and buggy because of a bridge washout. He could do nothing and she died from liver damage. Mushroom chemicals destroy liver function and death comes rapidly. It amazes me how many mushrooms are eaten by wildlife with no harmful effects. It would not surprise me to learn animals make deadly mistakes that we never discover. 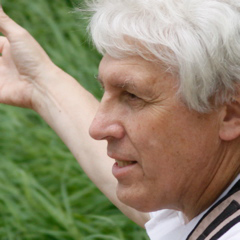 When I taught at Brainerd Community College before moving here to become director of the Howard Christensen Nature Center, I worked with Rudy Hillig, who was director of the Northland Arboretum (then called Paul Bunyan Arboretum) in Brainerd, Minnesota. Rudy told me about a friend who was President of Minnesota Mycology (Mushroom) Society. His friend from the Twin Cities stopped in to visit Rudy in the morning and they made plans to meet for supper. His friend went mushroom collecting for the day. While collecting, an elderly gentleman asked him if he was concerned about picking a deadly mushroom. Irritated with that frequently asked question, Rudy’s friend said they are rare and he grabbed a mushroom and bit it to make his point. He immediately realized his error and asked the man to get him to the hospital. The man said he did not drive. Rudy’s friend did not show up for dinner. Rudy learned he died from his mistake. Collecting edible mushrooms is a favorite outdoor activity many people enjoy. It adds delicious flavor to meals. Even the choice morels that people seek in aspen forests and near dead elms in spring have a look alike that should not be eaten. Learn what to collect by studying mushroom details in their nature niches. I am not a fan of mushroom taste but I enjoy looking at the tremendous variety that abounds when conditions are ideal. Warm falls with heavy rain are wonderful for producing great varieties to feed our eyes. I led a group at Ody Brook where we saw about three dozen mushrooms growing from the top of an old dead stump. The scene captured joyful attention of the hikers. That one event made the entire walk worthwhile. Seeing a large variety of mushrooms growing from tree bark to fairy rings sprouting from damp ground is enjoyable. The mycelium growing out of sight underground or under bark on dead trees remains hidden from view throughout the year. It secretes digestive enzymes that leave its body where it digests food that needs to be absorbed into the fungus. It is not the most efficient method of food capture but it works. When conditions are right, reproductive structures seem to rise into view overnight from the hidden mycelium. There are many varied types of beautiful fungi. The coral fungi look like they should be growing on a coral reef submerged in a shallow warm ocean. Instead they display reproductive coral-like growths with branching upright arms from soil here. Their colors include white, orange, and purple. Most are white and lure me outside to explore the varieties after a warm fall rain. The coral-like appearance is unmistakable. Major groups of fungi include the bracket fungi that protrude like shelves from trees. They have little pores on the bottom that expel spores. Gill mushrooms release spores from slits under the umbrella like roof and are sought by mushroom hunters to eat. A type of sac fungi displays beautiful little cups with bright red interiors. Enjoy the colors, shapes, and taste found in wild places. Fungi are essential for returning nutrients to the soil allowing plants healthy growth. Without fungi facilitating nutrient cycling, plants would cease and so would we. I’ve hunted morel mushrooms all my life—at least as long as I could walk. I am 62 and have never found them in March, until now! Not too sure how this will affect the late ones. If we don’t have a killing frost, as all the farmers are not wanting, this could be a year for the record! To change the subject, the old Union School bell sits outside of Hilltop. Why not move it to Red Hawk Field and let it ring again! Very few people even know it’s there. We are proud of our school and teams, let’s let history ring. David Marin took this photo of mushrooms on his property, southeast of Cedar Springs, along a woodland lane. “With the recent rains and cool nights, mushrooms are popping up everywhere around the woods,” said Marin. “I found this particular group of boletes unusual and engaging. Does it remind you of a dog with a litter of new pups? How about a mom trying to keep her kids out of the rain? A hen and chicks? “Remember to be absolutely sure of their identity before you eat any wild mushrooms. This type of bolete would taste fine but would soon make you regret having eaten them!” he warned. Send your wildlife or nature photos to news@cedarspringspost.com.